On his third solo album There's No Sound In Flutes, New York-based singer/songwriter/guitarist/blogger/pop-culture archivist Spike Priggen delivers yet another winsome, bracing blast of punchy, sublimely catchy guitar-driven pop-rock songcraft, filtered through the singular sensibility of a much-traveled musical adventurer who's a born romantic, a voracious pop-culture fiend and, above all, a lifelong believer in rock 'n' roll's ability to transcend, transform and inspire. From the jangly romanticism of "I Know Everything," to the scathing wit of "Everyone Loves Me But You," to the heart-on-sleeve sentiment of "Little Star," to the elegant, evocative twang of "The Only Girl (in the World)," the self-penned, self-produced There's No Sound In Flutes (on the artist's own Volare Label) maintains the same bountiful levels of craft, energy and heart that distinguished Priggen's prior solo releases, the all-original The Very Thing That You Treasure and the quirky covers collection Stars After Stars After Stars. Priggen's new songs also feature distinctive arrangements that make use of all manner of exotic sounds and textures. "I liked the way all the orchestral stuff on Stars After Stars After Stars turned out," the artist explains. "So almost every song on this one has some kind of orchestral element, from simple chamberlain and mellotron parts to complex 18-piece arrangements. I've always loved that sound, and once I realized that we could do these amazing arrangements, I wanted to have that on every song. Once or twice I thought we might have gone overboard on some of the songs, but they all eventually won me over." In addition to showcasing Priggen's performing and songwriting gifts, There's No Sound In Flutes also draws upon the talents of many of the stellar players with whom Priggen has crossed paths over the years. The album was engineered by longtime collaborator Adam Lasus, whose recent recording credits include work with the Rogers Sisters and Clap Your Hands Say Yeah. Cheap Trick drummer Bun E. Carlos, a longtime Priggen pal, is featured on two songs, while other tracks feature such stalwart New York players as guitarists Mark Spencer (Laura Cantrell/Jay Farrar) and Jon Graboff (Ryan Adams/Amy Rigby), bassists Danny Weinkauf (They Might Be Giants/Fountains of Wayne) and Scott Yoder (Kevin Salem/Amy Rigby), keyboardists Rob Arthur (Joan Osborne/Peter Frampton), drummer Brian Doherty (They Might Be Giants/XTC) and keyboardist/arranger CP Roth (Blessid Union of Souls/Ozzy Osbourne), who masterminded the album's inventive faux-orchestral arrangements. Meanwhile, renowned underground illustrator Peter Bagge provided the album's inspired cover art, which, like the disc's title, is based on legendary big-band drummer Buddy Rich's fabled tape-recorded rants. 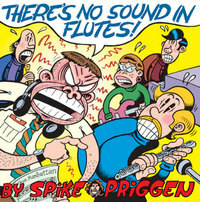 Although There's No Sound In Flutes is Spike (nee Michael) Priggen's third album under his own name, his lengthy musical resume encompasses numerous highly regarded bands and notable recording projects. In his preteen years, his life was forever changed by the energy and attitude of the original New York/London punk/new wave explosion, as well as the hard-edged power-pop of Cheap Trick, Big Star and the Dwight Twilley Band. By his early teens, he'd been swept into New Haven's thriving music scene, where he played in a series of bands with such future underground notables as Miracle Legion founders Mark Mulcahy and Ray Neal, Dumptruck co-founder Kirk Swan and noted producer/sideman Jon Brion. Moving to New York to study photography at the School of Visual Arts, Priggen worked at the legendary club Danceteria and formed a minimalist pop outfit, the Blue Period, with fellow Danceteria employees Nicole Willis (current Euro soul star) and Dmitry Brill (later DJ Dmitry of Deee-Lite). That Blue Period eventually evolved into the Hello Strangers, an eclectic and ever-mutating Priggen-led ensemble whose lineup would play host to a virtual who's-who of alt-rock royalty, including members of Miracle Legion, the Blood Oranges, Beat Rodeo, the Individuals, the Wygals, Pulsallama, the Go-Betweens, Yo La Tengo, Dumptruck and Blonde Redhead. The Hello Strangers' 1987 incarnation released a well-received album, Goodbye, on the independent Incas label. In 1985, Priggen moved to Boston, where he served two non-consecutive stints as bassist in the seminal Beantown combo Dumptruck; that period is chronicled on the archival live disc of the 2001 Dumptruck release, Lemmings Travel To The Sea. Subsequently returning to New Haven and then to New York, he relaunched the Hello Strangers while lending his instrumental talents to a variety of ensembles including the Liquor Giants, the Pussywillows, the Schramms, Big Louise, the Caroline Know and the Streams. He also launched an independent label, #1 Records, to release singles by several of those bands, and began dabbling in behind-the-scenes studio work, producing and/or engineering records by the Mad Scene, the Caroline Know and Containe. Later, during an extended overseas busking jaunt, Priggen played gigs in London and Glasgow, put together a well-received cover band that played in pubs around Edinburgh, and played and sang on an Edwyn Collins-produced album by former Orange Juice/Aztec Camera member Malcolm Ross. Upon returning to New York, Priggen (using the pseudonym Patrick Prophette) took on his first film-soundtrack assignment, composing music for the acclaimed indie film Chutney Popcorn in collaboration with the aforementioned Adam Lasus. Meanwhile, an abortive liaison with a major label convinced Priggen to pursue his recording career on his own D.I.Y. terms. He formed the Volare Label to release the The Very Thing That You Treasure and Stars After Stars After Stars, both of which earned an impressive level of airplay and press attention, belying the projects' D.I.Y. origins. As he continues to generate new projects, Priggen's back pages continue to intrigue listeners around the world, as evidenced by the upcoming release of Pop As Can Be And Dance City All The Way, which collects previously obscure tracks by his early-'80s new wave bands TV Neats and the Excerpts, on Japan's Wizzard In Vinyl label. In recent years, Priggen has also emerged as a popular presence in cyberspace, thanks to his website www.bedazzled.tv, which showcases a dizzying and ever-mutating treasure trove of music, video and pop-culture ephemera as well as trenchant political content. The site was recently named one of "50 Meilleurs Blogs" by the legendary French magazine Les Inrockuptibles. Meanwhile, the lifelong tunesmith continues to move forward in his ongoing musical quest, exploring new variations within the melodic pop-rock format that still inspires him. "I've kind of established a pattern of writing bummed-out pop songs, but there's a couple on this album that are a bit happier than usual for me," Priggen observes, adding, "I've actually been in a happy, stable relationship for nearly ten years, but I still have a reserve of good songs left over from all the bad ones. In a weird way, it's more satisfying and fun to write sad songs than to write happy ones. The sad songs are the ones that seem to really affect people; I know they're the ones that get to me."